The Department of Justice (DOJ) bagged two (2) prestigious awards for its full implementation of the government’s Freedom of Information (FOI) campaign. 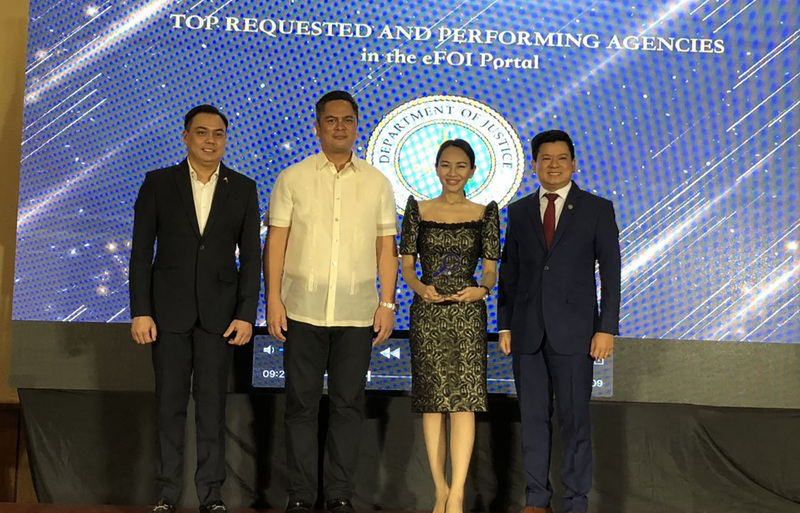 The DOJ was recognized as one of the Top Requested and Performing Agencies in the e-FOI Portal and one of the three (3) nominees shortlisted to the Department Award category during the FOI Summit/Awards spearheaded by the Presidential Communications Operations Office (PCOO) at the National Museum of Fine Arts in Ermita, Manila last 28 November 2018. Undersecretary Emmeline Aglipay-Villar, along with the FOI team of the Department received the awards in behalf of the DOJ. “The right of the people to information on matters of public concern as enshrined in the fundamental law of the land is a mandate to which we faithfully abide. We vow to continue our extensive efforts towards transparency to eliminate all forms of corruption,” Justice Secretary Menardo I. Guevarra said in a statement. The FOI program is implemented by virtue of Executive Order (EO) No. 2 series of 2016 which operationalizes in the Executive branch the people’s right to information and to do full public disclosure and transparency in the public service. For more information regarding the DOJ’s implementation of the FOI program, please follow this link: https://www.foi.gov.ph/requests?agency=DOJ.